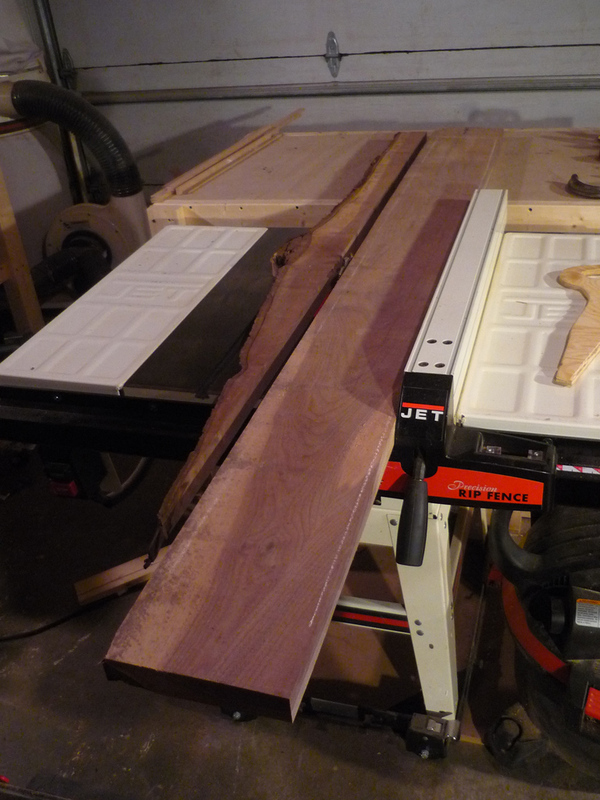 First I took the slabs and figured out what portion I could take for the top, given how wide and how long it would have to be. 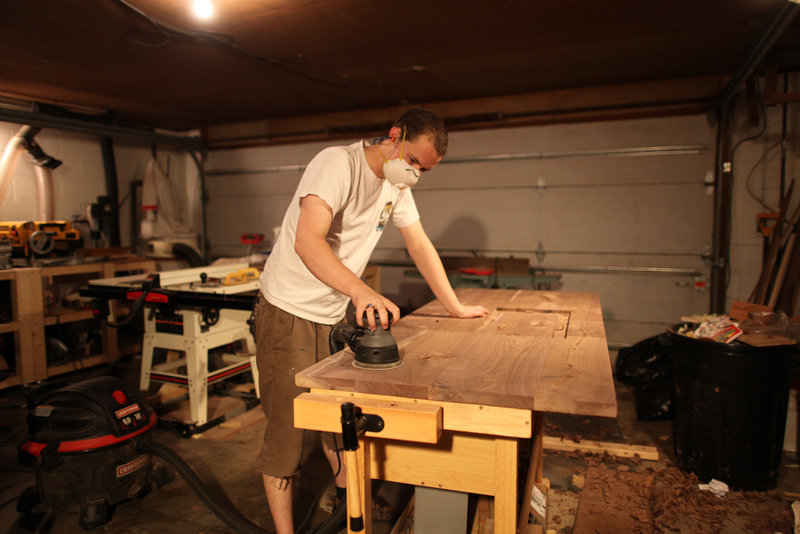 Then I cut the bark side off on the table saw with a special thick-stock rip blade from Freud. 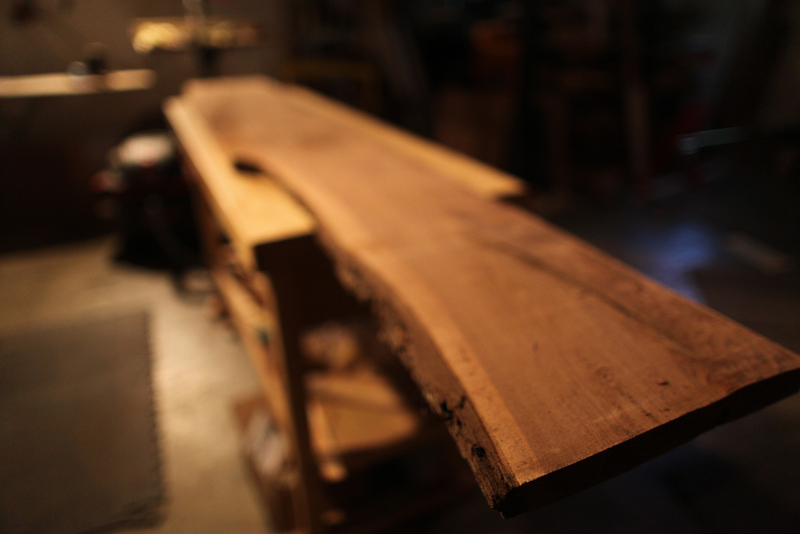 Then I put them through the planer to take off the rough face and get them to a uniform thickness. 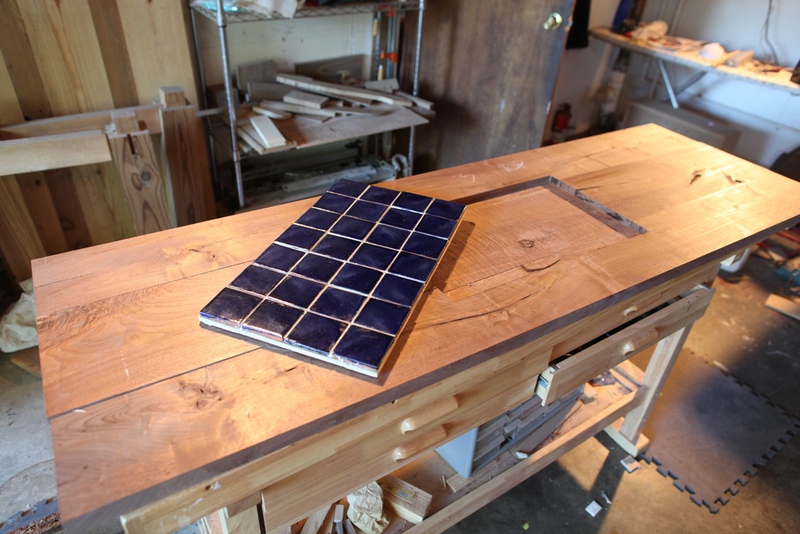 I wanted to have an inlaid tile plate on the top so I routed that out before I glued them up. 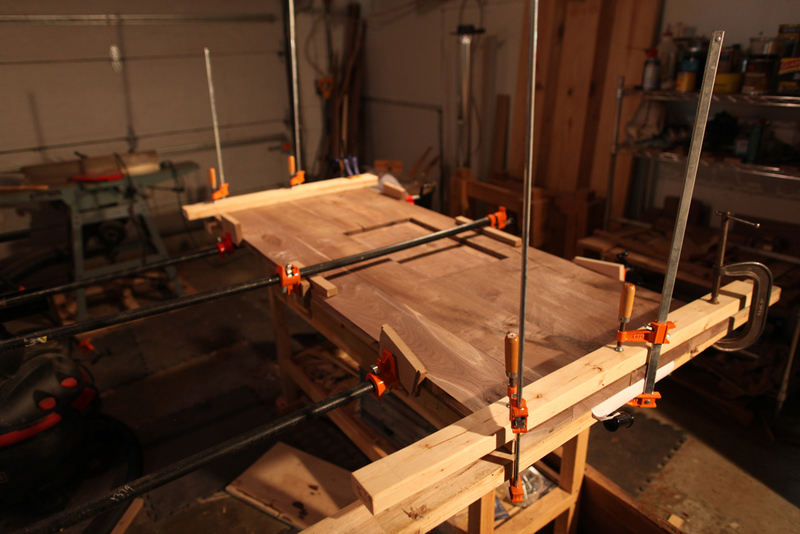 Then I glued up the slabs with the help of dowels and 2×4 cauls to keep the top from bowing. 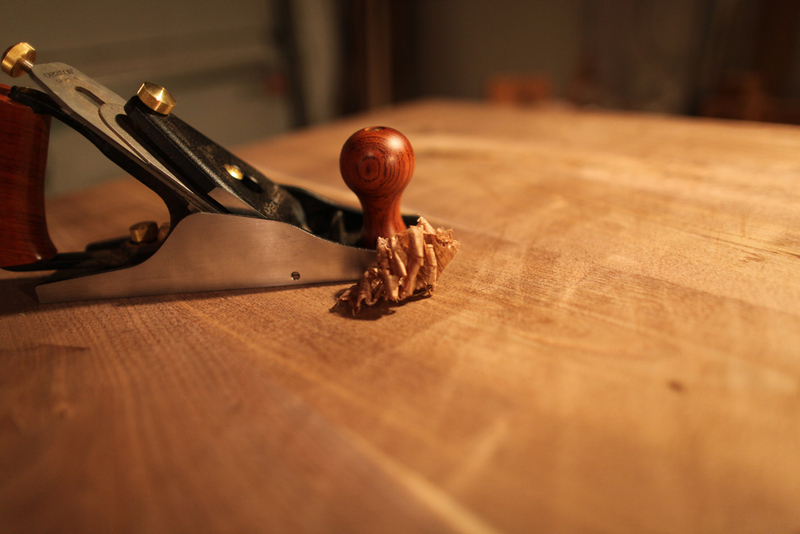 When the glue had set, I sharpened up my hand planes and went to work getting it nice and flat. 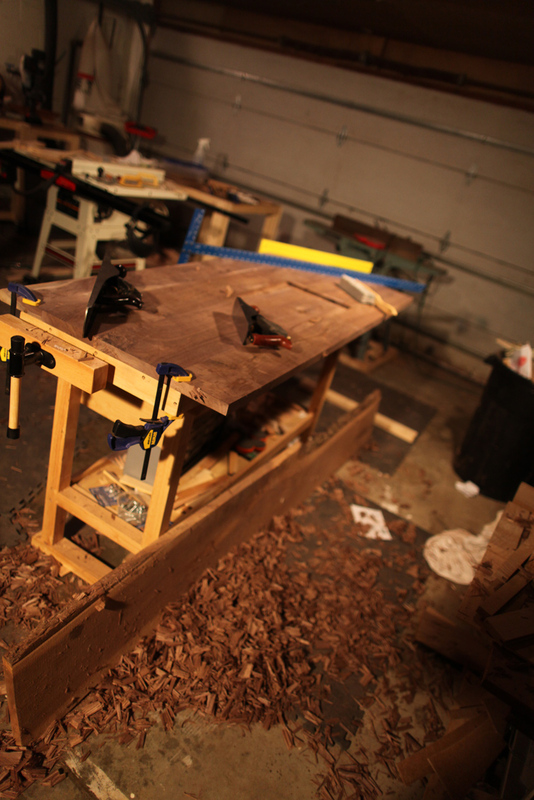 I used two planes, a Veritas #4 and a Bailey jointer plane with a Veritas A2 iron in it. 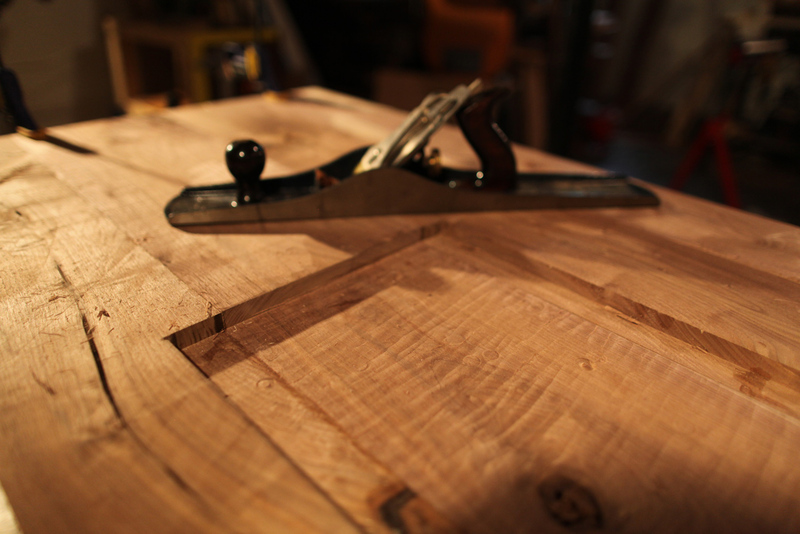 I used the Lee Valley camber roller honing guide to sharpen them on the water stone, which gives a slight curve to the plane’s iron, and eliminates the track marks cut into the wood by a blade that is 100% square on the edges. I planed it for 2 days straight, basically. 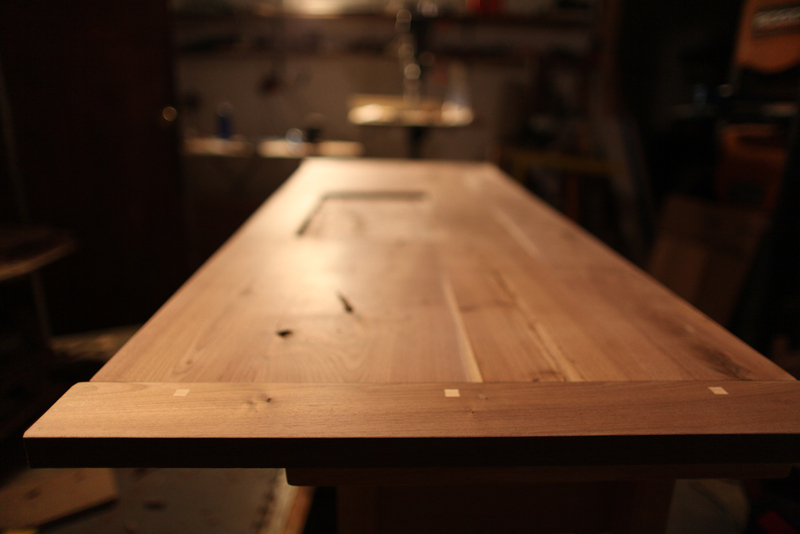 Then I sanded it for 4. 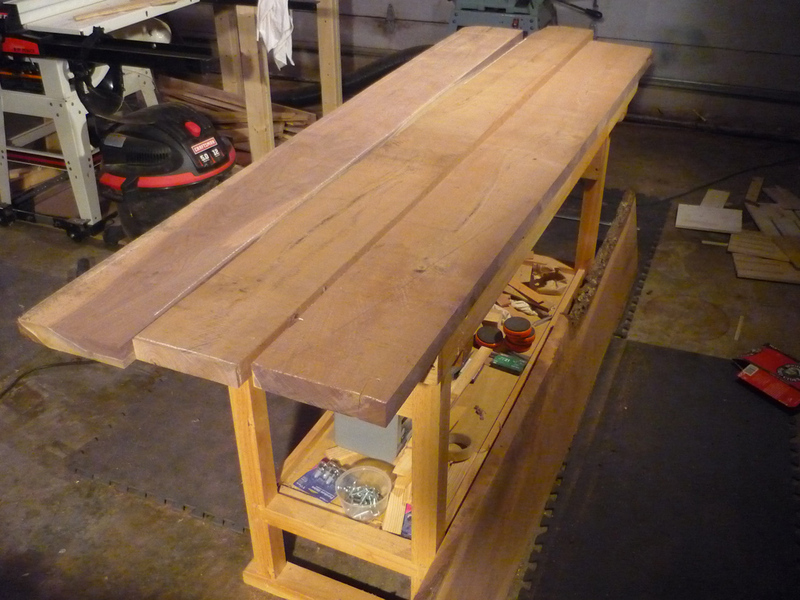 When it was sanded and flat, it was time to fit the breadboard ends. 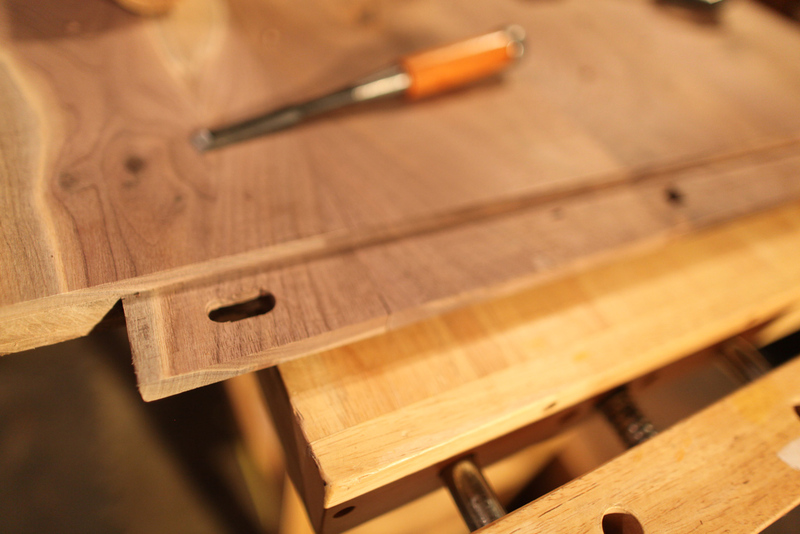 I knew the groove in the breadboards would be 1/2″ so I cut the end of the table to that thickness with a circular saw to define the edge, a router to cut out the waste, and my Japanese saw to cut the shoulders. 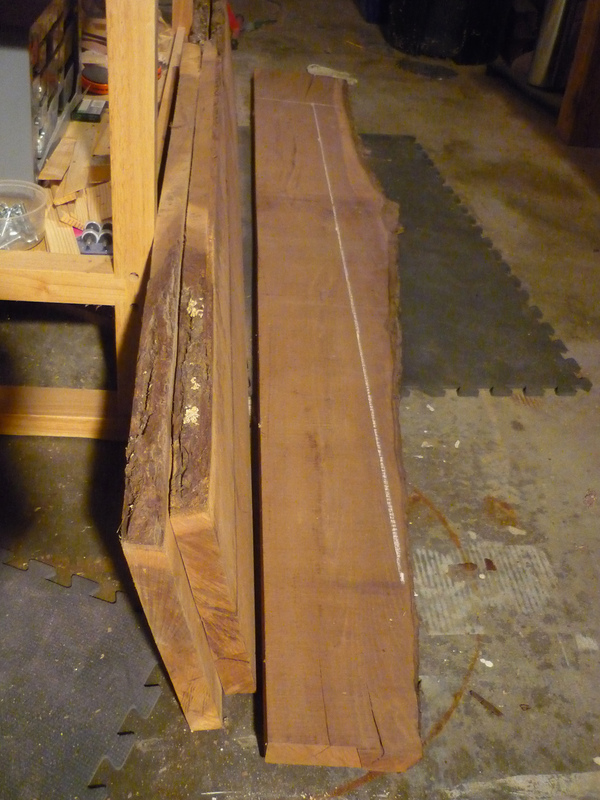 Then I cut the breadboards themselves from a single piece of walnut, again from the same tree. 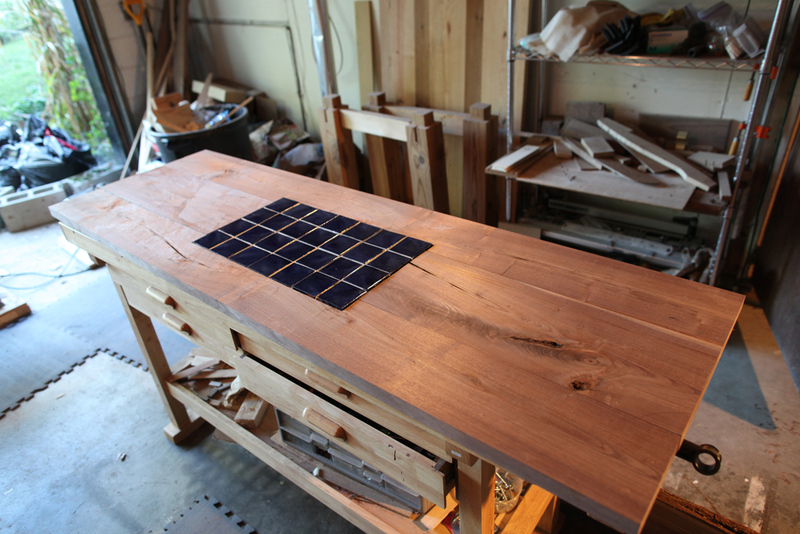 I beveled the ends on the table saw first. 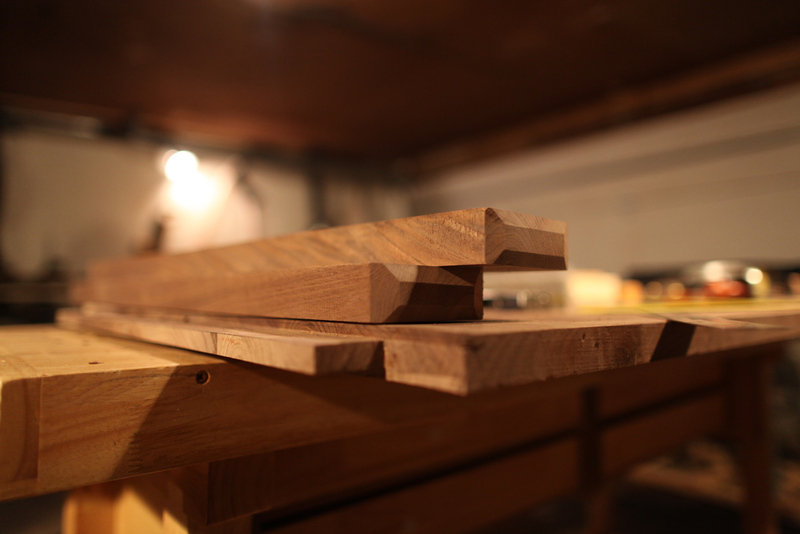 Then I routed out the tongue groove with the help of an edge guide and a little platform I threw together from plywood scraps to support the router. I dry fit them just to make sure. 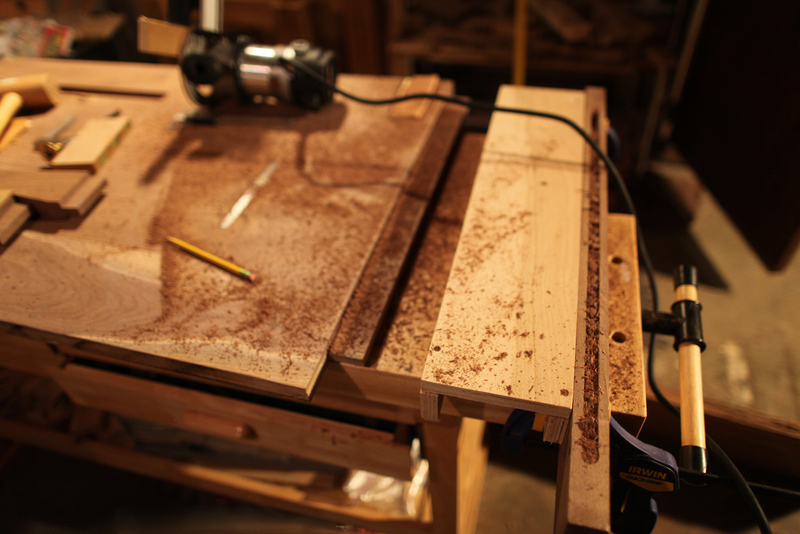 Then I cut the holes for the pegs in the tongue and the breadboards. 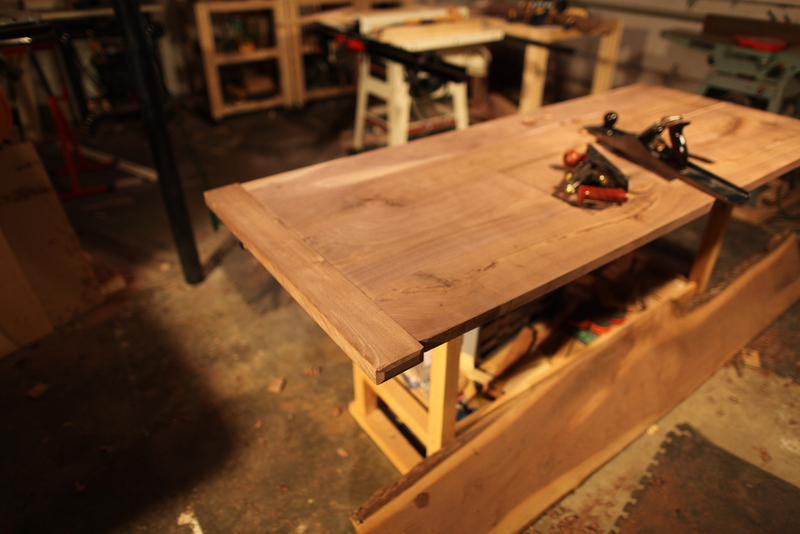 The table will expand outward from the center, so the pegs on the ends need to be able to slide, or it will crack the top. 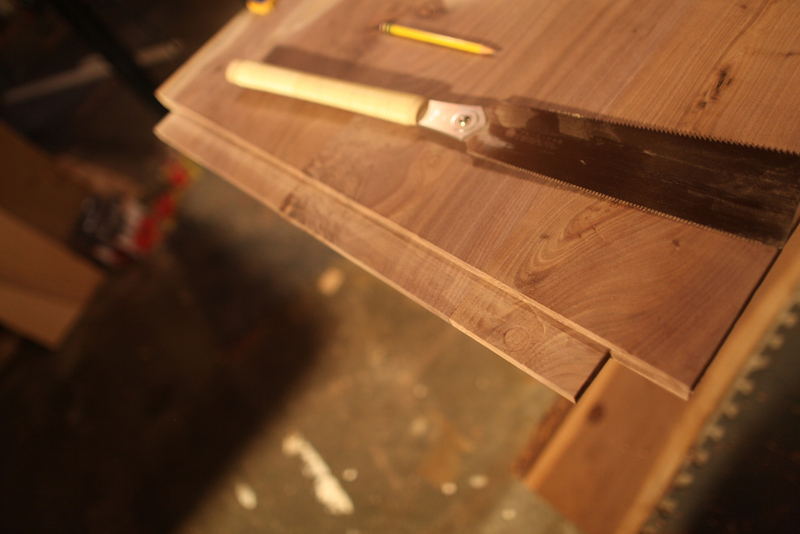 Then I cut the square peg from ash to fit in the hole. 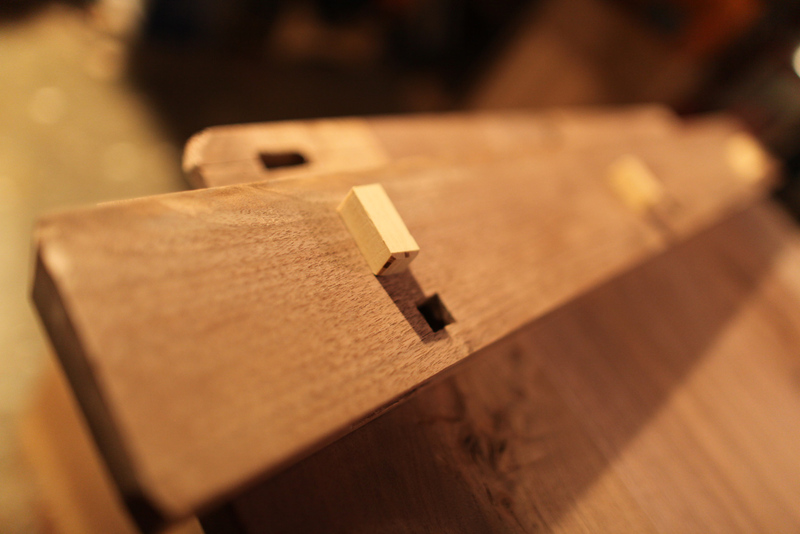 Then I glued the breadboard at the center of the tongue only, and seated the pegs. And that concludes the top! ~ by Josh on December 29, 2011. 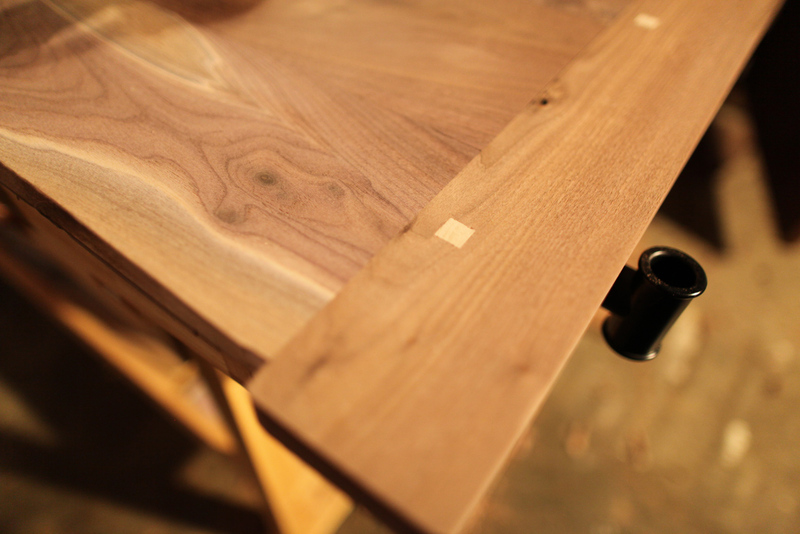 I always love it when you do these walkthroughs of your latest creations. Keep up the good work. Gah I wish I had it done months ago! It’s really close now though!